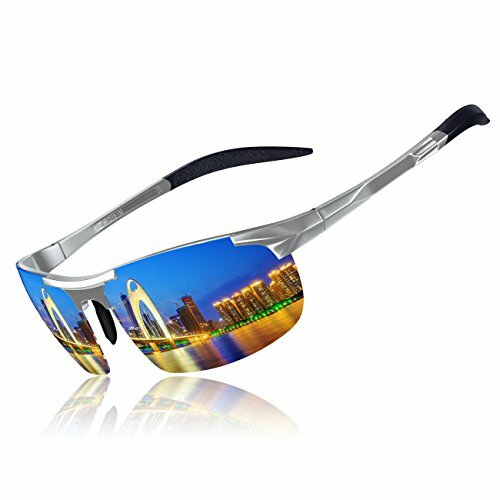 NOTE: Please choose the Official seller KITHDIA, if you choose other sellers will probably not receive the sunglasses, or receive a bad sunglasses with different descriptions The Sunglasses for Men are Fashion Cool Metal-Frame design;Target User for Fishing, Golf, Cycling, Running, Driver Sunglasses and all Active Outdoor lifestyles! Brand: KITHDIA Design From Italy Frame Material: Aluminum-magnesium Lens 100% UV protection lens. Size:Can Be Adjust to fit your size！ Package :Sunglasses *1, Case *1, Glasses Cloth*1, Polarized test card*1,Screwdrived*1, black gift box*1 Weight:The Sunglasses only 25g or so, You can hardly feel them on your face, but they are unbreakable. Service: We provide 40 Day refund and lifetime Warranty on Frame & Lens. Trademark CertificateUnited States Trademark Office registration number : 87461560 KITHDIA provide the most high quality and fashionable,The coolest sunglasses. Please pay attention more KITHDIA Brand, You will find more surprises! How Do Polarized Lenses Work? Light reflected from surfaces such as a flat road or smooth water generally is horizontally polarized. This means that, instead of light being scattered in all directions in more usual ways, reflected light generally travels in a more horizontally oriented direction. This creates an annoying and sometimes dangerous intensity of light that we experience as glare. Polarized sunglasses reduce glare reflected off of roads, bodies of water, snow, and other horizontal surfaces. Polarized sunglasses cut glare and haze so your eyes are more comfortable and you can see better. POLARIZED LENSES THAT ELIMINATE GLARE - Lenses eliminate glare that makes it difficult to see and will not wear down over time. Great for driving, sports, shopping adventures, time at the beach, and any other activity you'll use them for! INCLUDES POLARIZED TEST CARD, A LARGE HARD CASE, SOFT CASE, MICROFIBER CLOTH AND SCREWDRIVER - Easy storage with the large case. Need something smaller? Use the soft case for that. Screwdriver allows you to tighten those screws from time to time. Microfiber cloth for keeping them clean! If you have any questions about this product by KITHDIA, contact us by completing and submitting the form below. If you are looking for a specif part number, please include it with your message.